Here's ya a link to the main BRP Site and a map I downloaded from that that's not there anymore but is pretty handy on Tablet like the Kindle Fire! Have fun and be Safe!! Hmm..... For some reason I can't get the map PDF to upload.... PM me tour email addy and I'll send it to ya! I did the entire trip from Cherokee, NC to the end of the Sky Line Drive at Front Royal, VA two years ago. I did it in 3 days on my way home from NASSIR 7. I wish I would have taken 5 days to do it. Take it slow and enjoy the sights and sounds. Whether or not you can make it in time, Willville is a great spot to camp and get information about the BRP and sights. Well spent Saturday going over the bike getting everything ready for the trip. Changed oil checked and topped off all the fluids. New rear tire on and trailer checked over . Then we took it out for a 400 mile shake down run this weekend. Just need to get through the next few days at work and hit the road on Friday. Looks like weather will be good not making any set in stone plans jus flying by the seat of my pants as the wife calls it. Don't know who is getting more excited about this me or her. Have Fun and Ride Safe!!! Been riding and driving the BRP since 1970 .... (and I guess my first trip was when Dad & Mom drove a short ways of open section in the '50s on the way back to Texas .... we moved back to Va.in 1959). Love the BRP, have been on it in rain, snow, clear, spotless clear, you name it .... only once did I wish I was somewhere else and that was maybe 2002-03 on the GL1200 with "Wife Unit" and our little Abby aboard. Started as a light rain .... got foggy some, pulled over at Rt 128 and decided to not go up Mt Mitchell, better to get off mountain as it looked bad up there .... went around curve and from there to Craggy Gardens, I didn't hardly see even a roadway edge. I maintained 20-25 mph afraid I'd get run over or miss a curve, lost horizon, could not even see to get off the road .... steered by the line. Just before Craggy Gardens, fog lifted .... what a wonderful sight. So Blessed we were..... don't think we ever met a vehicle ...... thankful the good Lord cleared the road. Well .... there was that day in 1995 when we were down at Bluff's Lodge on the Trident and awoke to a cold rain .... all the way home to the Shenandoah Valley. That was a long day ... but not near as scary as that fog. Otherwise .... Always a great ride no matter Car / PU / Bike / Trike. Never tire of it, always something new, always the familiar, always a refresh of the spirit. One of our favorite stays is Park Vista Inn & Resturant at MM 268. We've been staying there several weekends a year since late '90s when we first found it open one evening, got to know the then owners really well, kids, etc ..... almost like family. Then they leased it out, then it closed, and now it's OPEN again ..... wonderful upgrades, super food, love it .... just as soon eat there as go to Shatley Springs. 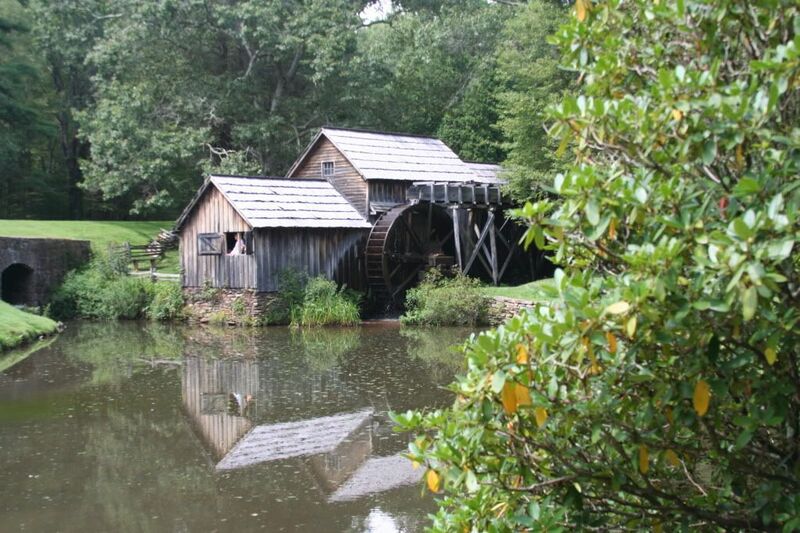 Another good stay is Pisgah Inn .... just costs more. Sure miss Bluff's Lodge and the Coffee Shop days though .... that was the place of some cherished memories. Hope someone opens it up again. Up on Mt Mitchell, the Visitor Center just before the top, good place for a light lunch. Was up there once on the car, 8 degrees .... figured no bikes that day .... snow frosting on one side of trees, clear sky, walk out and here comes a couple on a pair of BMW Boxers. BRRRrrrrr! Recall all too well the days before the Linn Cove Viaduct was opened ..... long slow detour on that narrow Rt 221 below. Was so nice when they got that up and going. Would love to again see Whetstone Ridge and Otter Creek campstore / resturants reopened. Whetstone is offices now but facilities are open. Otter Creek is shuttered. Estella and I went to the first the first Blue Ridge get together at Willville campground. Getting there was interesting (do not use your GPS). Great story about 2 people in their 70s doing a 700 mile ride to get there and riding Crooked Snake Rd. at 11:00 p.m.. Then when we left the event we wanted to ride the BRPW down to the tail of the dragon. Easy peasy was the word. Just go down the road 1/4 mile and get on the parkway. We did. However 50 miles later we figured out we went the wrong direction. But the rhododendron were in bloom and we knew all roads could lead home to So, IL. Had another interesting time with a elusive campground up in the hills, bears and that dirty 4 letter word that starts with R and ends with N. After that we stopped in a KY campground that the only thing Mitch McConnell did not get built was a geyser. Concrete 4 lane highways in the middle of nowhere with 2 lane blacktops on both ends. Crazy trip. Yes! Fun trip? Yes! Good time with great people? Yes! Watching John (JOBE05) almost melt down when his meat was not cooking fast enough? NO! So we do not know about the south half but the north half was a great ride. BTW, the speed limit is 45. I used my GPS to get to 'Willville and did not have any problems at all. I stayed in the hotel myself, I am a sucker for Air Conditioning and hot showers. Hot showers? Isn't that what riding in the rain is for? I've ridden the BRP in it's entirety about 4 times, going in both directions. I favour the southern section best as it is usually less travelled, has the highest elevations and has more tunnels to ride through. Plenty of areas to tent camp, either on the BRP itself, or a short distance from it! Riding it at the posted 45 mph speed limit (or 5 mph above) is a very relaxing ride, missing all the local traffic and unless you are turning left at the very end of it, no stop signs in it's entire length! One of my favorite N/S travel corridor routes!! 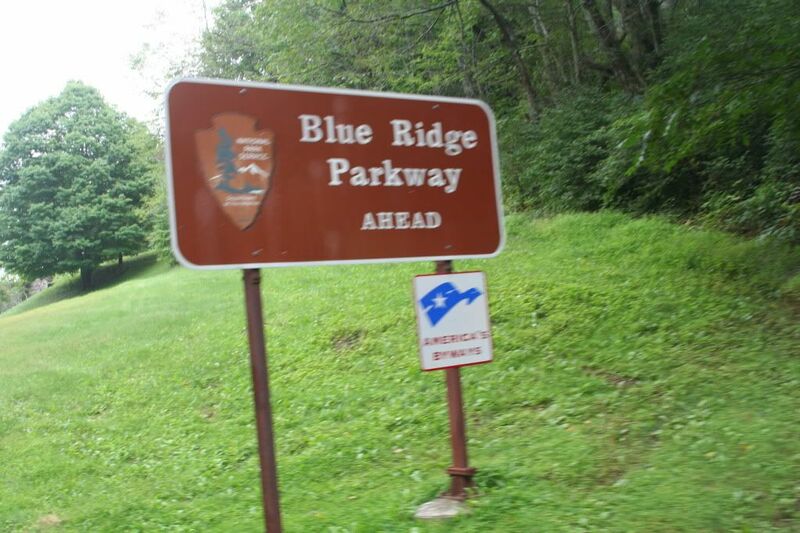 Wife and I have ridden Skyline Drive from Front Royal to Rockfish Gap - where it hooks up with the Blue Ridge Parkway a number of times since 1982. Back in 1985 I was riding a new Aspencade and had a video camera attached to the right engine guard. Videoed a large portion of the Blue Ridge Parkway until the battery died. Have ridden the BRP several more times on my GL1800 motorcycles. Some of my favorite times were riding those roads. 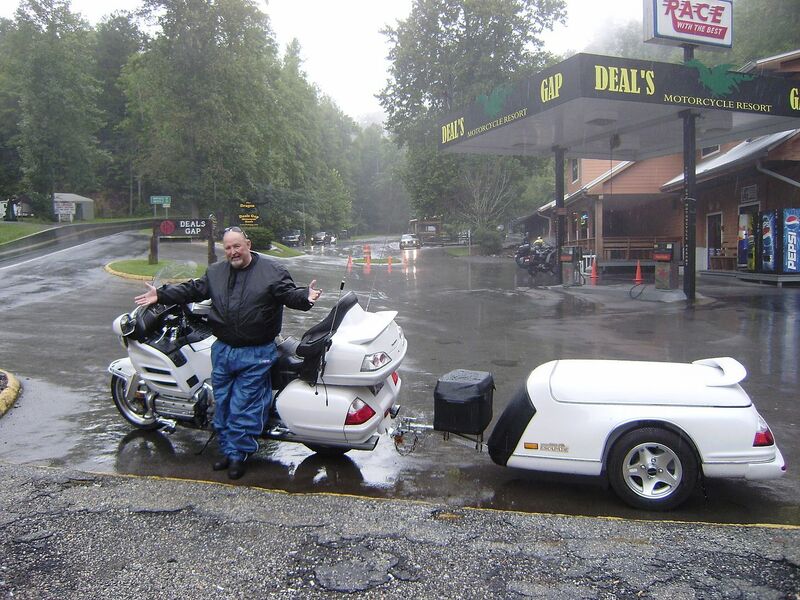 One time in 2010 I was at Deal's Gap riding in the rain on our 2008 Pearl... NOT FUN! 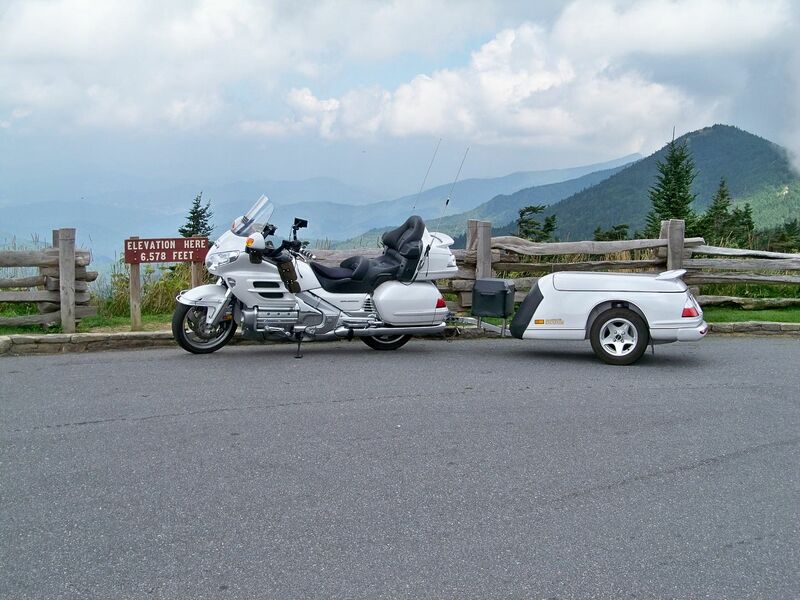 This past year in October we did the BRP and the Cherohala Skyway in October that included a stop at Deal's Gap. Not raining this time. 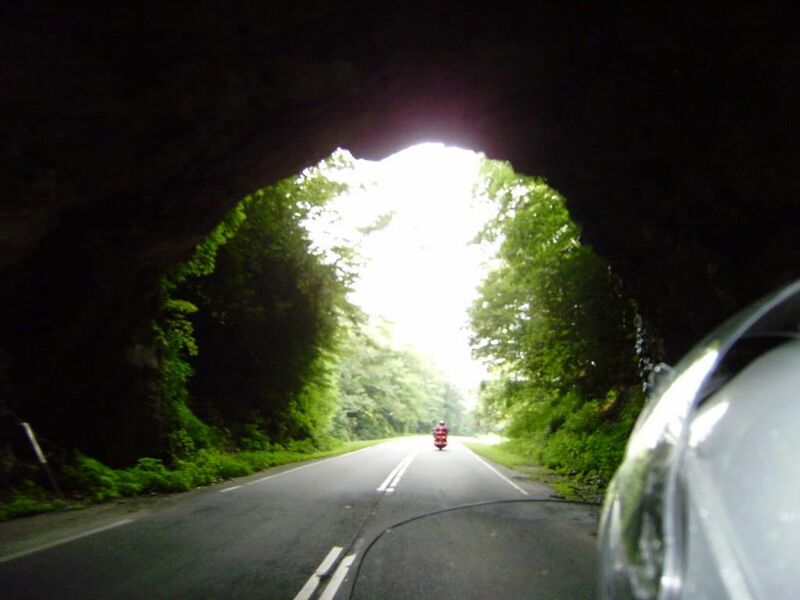 Favorite photo from the BRP following another Wing thru a BRP tunnel. My suggestion - ride the BRP and ride it often! Back to the regularly programmed topic - sorry for my interruption. I know this is an old thread but a good one. I usually try to ride the BRP at least twice a year. I love staying at Willville's Bikecamp. I will be doing it this year in May and then again in September. I enjoyed it while I was there, but it is a long long way just to get there for me. One great place to visit while on Parkway is Nancy's Candy Company. Have yet to meet someone that didn't enjoy that place.